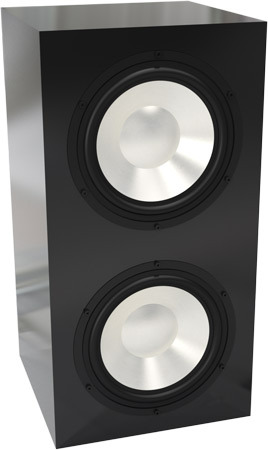 Alcone Sub 20 Definition is a compact high-end subwoofer. Dennis Frank und Daniel Gattig have developed this woofer. Alcone Sub 20 Definition is home to two Alcone AC10 HE woofers and an amplification module. In a listening test Peter Strassacker found with the smaller Alcone Sub 10 Definition that the 24 cm Alcone AC 10 HE seems to be a perfect woofer. Only few combinations like this could be identified up to now. In Definition subwoofers the loudspeaker(s) are mounted into a closed chamber. This ensures maximum flexibility and precision. The Definition series is optimized for sound quality without compromise. The subwoofer is equipped with a subwoofer module like Mivoc AM 80 or other modules. Every module contains an adjustable analog filter (active low pass). The modules are made for the installation into the casing. The amplifier module is located at the rear of the cabinet. More and more customers are asking for a subwoofer where the cone's oscillation is controlled perfectly, reproducing a low bass and mountable in a small cabinet. We recommend the Definition series.